Restaurant with Real Estate in Great Carmichael Area! SellingRestaurants proudly presents a fantastic opportunity to own a 3,200 sq. 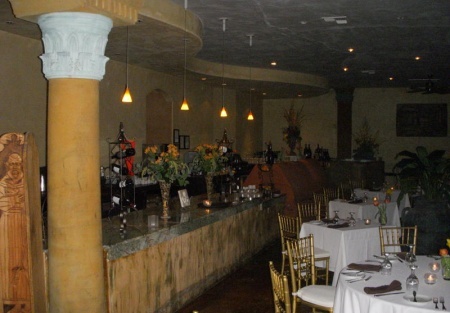 ft. restaurant with real estate in a super high traffic, prime location in Carmichael. The building is already setup as nearly a turn-key restaurant. Just add tables, chairs and a few pieces of kitchen equipment and you will be up and running quickly! There could be a wine and beer License available as well. Beautifully decorated with Venetian plastered walls and concrete pillars, a custom made wine bar and more...this restaurant is only limited by your imagination. Previously the facility served as a high end restaurant and caterer, but could also serve a nicely appointed casual establishment as well. American, Italian, Greek, French or where ever your passion steers you! The current owner had his life in Italy interrupted to come back to deal with a tenant who walked away from the building and filed BK. The tenant didn't fail because there wasn't volume at this location; rather the tenant failed because he had grand visions of being "THE" caterer to the stars and the wealthy with their luxury living style and their private planes. Unfortunately the recession killed those plans and his services were the first to be cut. The owner wants to return to Italy immediately or open up an Italian Restaurant & Pizzeria. So this Last Opportunity to pick up this property at a this low price even in this depressed market. This price was determined using a net rent of $4,000 a month (which is nearly 40% lower than what the building was renting for just a few months ago) with a cap. rate of 9%. You can play with the numbers yourself and you'll end-up discovering this is a great buy! You will own the building so you can operate as owner/operator or lease the building as you see fit. The bottomm line for an investor is you can lease it out and have a positive cash flow imediately or sell it in a few years and turn a profit. The owner operator scenario is just as good with a mortgage that is less than most leases in similar high traffic around Sacramento. Think about your current situation, what would you future be like with below market rent with an asset to sell later. What are you waiting for ...Be the landlord and have the opportunity to see a return on you rent monies! Make an offer now and benefit from a price that is thousands below market value! TAKE THE NEXT STEP. Select the bright orange button below title "want name and address." Register if you're a new client and sign the online "Confidential Agreement." Then contact the Agent directly via email. This will also place you on our exclusive Buyer's e-mail list, giving you first look at our new listings.This is a Paramount Restaurant Brokers, Inc. listing. Neighboring Landowner Will Lease out parking spaces at a low cost.